Scientists have yet to figure out why we can move through space in any direction, but only ever go forward in time. Braid's basic mechanics break this fundamental rule by letting players explore the consequences of moving backward through time. In World 4 of Braid, space and time become entwined so that moving to the left of the screen rewinds time, while traveling to the right restores its normal flow. It leads to some clever puzzles, but also makes you think about the nature of time. 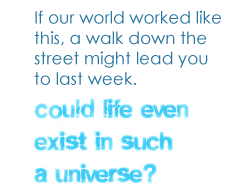 If our world worked like this, a walk down the street might lead you to last week. Could life even exist in such a universe? Things get even weirder in World 5, where rewinding leaves behind a shadowy doppelganger to carry out your previous actions while you take an alternate path. It's an illustration of the "many worlds" interpretation of quantum mechanics, which suggests there is a "multiverse" of parallel universes where every possibility exists. If the theory is correct, then there are universes where the Nazis won World War II, the Dreamcast never died and Duke Nukem Forever actually got released. Braid lets us imagine breaking through the boundaries of the multiverse and interacting with our alternate selves. Finally, in World 6, players gain a gold ring that distorts the time-space continuum: As objects approach it, time begins to move more slowly for them. This slowing effect is exactly how gravity works. According to the Theory of General Relativity, massive objects like planets or black holes warp the fabric of space, causing time to slow down. On Earth, the effects are almost imperceptible, but they do exist - GPS satellites have to be corrected by about 40 microseconds per day to compensate for the effects of relativity. We struggle to comprehend such a short period of time - even blinking takes 10,000 times longer - but exaggerating the effect in a videogame makes it easier to understand. These concepts may be borrowed from high-level science, but they work in a videogame because they're interesting to play with. With Braid both a critical and commercial success, perhaps more developers will include scientific ideas in their games. What about a Wipeout-style racer at near light-speed, in which space appears to warp as you hurtle round the track? Or a puzzle game where you manipulate strange magnetic ferrofluids? There are plenty of edutainment titles that explain scientific theories, but the real strength of videogames lies in letting us explore these strange concepts ourselves in a way no other medium can. It's time to leave the mad professors of science fiction behind and embrace the weird and wonderful world of science fact. Jacob Aron is a science and technology writer based in London. He runs justatheory.co.uk and regularly contributes to NegativeGamer.com.